USA: Dog Abandoned To Freeze To Death In Polar Vortex Deserves Justice – Petition – Please Sign. Goal: Punish the person who allegedly left their dog outside in the bitter cold to freeze to death. A dog was reportedly left outside to freeze to death during a dangerous polar vortex. The pup’s body was then thrown in the trash, allegedly by the owner. Demand justice for this poor animal. 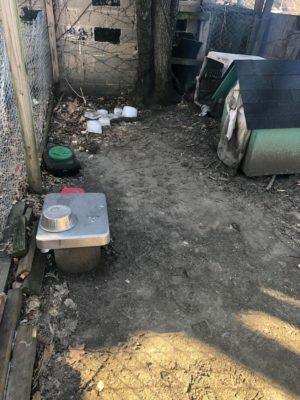 Workers with Indianapolis Animal Care Services happened upon a horrific scene while sweeping the area for animals at risk. An empty wooden doghouse, blocked only by a towel, was reportedly the only protection one dog had from the bitter cold. A photo of a frozen water dish illustrated the seemingly horrific conditions the dog endured before eventually freezing to the ground. Rescuers found the animal’s remains in a dumpster, reports stated, and the body appeared incredibly malnourished. An investigation is underway, and charges are likely to follow. Sign below to demand that the person responsible for this dog’s death is charged with animal cruelty and assigned the maximum penalty possible. A frozen dog was reportedly found in a dumpster in a shocking case of animal cruelty. Per investigators, the dog froze to death after being left outside in the bitter cold. I demand justice for this poor pup. A dog reportedly froze to the ground after the poor animal was allegedly left outside without adaquate shelter. Indianapolis Animal Care Services stated that they found the pup’s remains in a dumpster while searching for animal’s at risk during the polar vortex. The dog’s final days were spent in a cold wooden dog house, investigators stated, with only a towel to block the wind. A photo, taken at the scene, showed a frozen water dish in the small fenced-in area where the dog initially died. Investigators suspect that the dog’s owner allowed the animal to freeze to death and then moved the body into the trash. Any person who could allow a dog to die in such agony is a danger to animals and must be punished. I demand that you charge this person with animal cruelty and seek the maximum penalty possible. USA: Govs. Cuomo and Murphy: Rescind the Port Authority Kill Contract with Wildlife Services – Swan Killers ! Uruguay: Street sweeper breaks a dogs spine with a kick and it had to be euthanised as a result. Petition – Please Sign to Demand Justice for the Dog.